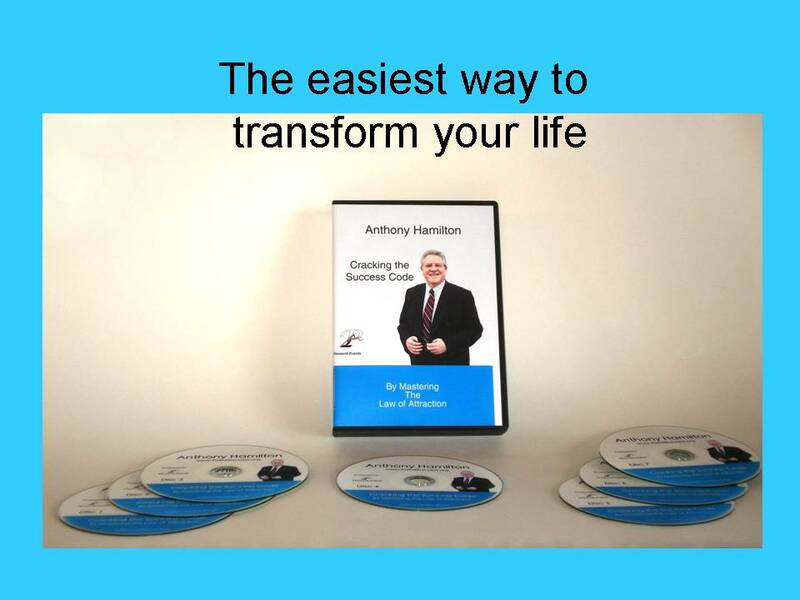 Crack The Success Code - How to Win the "Inner Game of Success"
﻿"Master the Law of Attraction"
Recorded before a live audience! 1995- A Revolution in understanding the mind and brain. You can change the brain just by thinking in a certain way. Things don’t happen to you; they happen from you. How are you seeing reality? Getting INSTANT RESULTS → long term changes in your life. How does an apple tree produce apples? The success is in the past but the feeling is now. Children interpret everying as about “me” → self image. Negative experiences shape our self image. We all make up ‘stories’ to explain our experience. What meaning did Stallone give to his experience? What meanings or stories have you allowed to stop you? Thomas Edison’s story = not “failure” but “learning”. “Why is a chicken like an apple tree? Your mind will always answer any question. How to apply past lessons to your present goals. An overview of the goals achievement process. How to increase your desire to win and your belief in your power. You must remain conscious of your progress. How to rewire your own brain. Changing negative events into positive events. Memory is a connection not a recording. To be successful you must have goals. Does information move through time? Is time travel a reality? Mind’s default mode is as a time machine. Definition of a goal: A possibility I have decided to experience. Q and A Demonstration of the “Shrink it down” technique. How to deal with negatives 3: “The Secret of Chaging the Past”. Overcoming procrastination by changing your thought process. Tying together positive feelings to your actions and goals. “Make it a Habit” The important role that habits play in our lives. What is your “thought ideolect”? Which way are your thumbs? Is Your Self-Image just a Habit? How Benjamin Franklin changed his. The Magic Power of Repetition. Taking Daily Action Steps to Make Daily Progress on your Life Journey. Taking your life and your business to the next level. Maintaining the Integrity of Your Vibrational Bubble. Do You Make Yourself Feel Bad Just to Get Sympathy? Tapping Your Greatest Undiscovered Resource. How to Get Information from the Future. How to Discover and Develop your Psychic Ability. How to recognize and use your psychic ability in practical ways. How Does Your Future Communicate with You? Anthony's Book, "Mind, Time and Power!" Order the complete package now! when you click the 'Buy now' button.